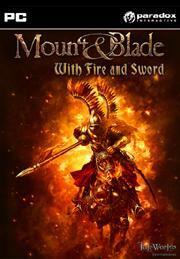 Mount & Blade: With Fire and Sword is a story based stand-alone modifcation using the Mount & Blade: Warband engine. For those who enjoyed the original Mount and Blade, $15 can get you mutliplayer action and a good single player campaign. If you already own Warband you may want to read the rest of the review before buying the expansion. The Mount & Blade series is known for its open-ended single-player campaign. Fire and Sword is now tied to a story but you can follow it at your own pace. When you start the game, you are attacked, rescued and given a rundown of the new factions available in this game. To begin the storyline, you will eventually have to align yourself with a faction. Until then, you can attack bandits, join them, pursue vassalage, become a merchant or a mercenary, or take on a Robin Hood role; it's entirely up to you. You can even pursue your right to rule and become the king and conquerer of Europe. Quests can also be given to you by village elders, guild masters, Lords, their Ladies, and Kings. The quests vary from delivering a letter, cattle or other things, to defending a lady's honor, or even performing espionage, and many other tasks. When you complete quests, your relationship will improve with the person who assigned the task to you. Quests usually have to be completed within a certain time frame; however, they're usually pretty generous, unless you're being summoned for a military campaign. And to keep track of it all, there's a handy journal to record your quests. If you decide to become a vassal for a king, he will usually reward you with a town's taxes for revenue. You will also have the option to make improvements to your town, such as adding a mill, a school, or by hiring people like priests, marshals and treasurers. Castles allow you to garrison an army and collect rent from people resting there. Unlike Warband, when you own a castle, you no longer have the option to host a banquet to improve relationships with lords or women. The option to marry has been removed as well. To go along with the "With Fire and Sword" novel, you're also limited to playing as a male character. You can play as a woman in multiplayer though. Battles are inevitable but you don't have to fight alone, you can recruit a war party from taverns and villages. However, the party size depends on your charisma and leadership attributes. It's important to remember, there are disposable party members and hero party members. The hero party members will not die in battle; they will only get knocked unconscious. In Warband you can have these heroes become your vassals after you are king, but this not an option in Fire and Sword. These heroes have attributes, weapons, and armor that you can customize as they level up. It's pretty easy to adjust their skills and equipping them is pretty straight forward too. But you can't equip them with items that they don't have skills for. They also have personalities that like certain hero characters and despise others. If your party is mismatched, you'll get bickering and your morale will lower until someone eventually leaves. If a hero party leaves, you can get them back at a random tavern. Battles are quite fun and don't get tiresome. The scenery and loot varies depending on who and where you are fighting. The enemies are challenging too, especially if you are out numbered. You issue battle commands and if you want you have the option to send your army to fight without you. If you're in a real pickle, you can leave a few men behind to help you escape, but that doesn't sit too well with some hero party members. New to Fire and Sword are guns and grenades. I don’t like the guns since I find them very inaccurate and they take too long to reload. When you besiege a castle, you now have options for poisoning the well or bombing a wall. However, I was only able to successfully bomb a wall. When it comes to fighting the AI is relatively smarter. They still attack in swarms but they will block your attack with their guns, swords and shields. Graphically this game hasn't changed too much. It's not up to par with most AAA titles but it gets the job done. There are new textures and buildings for the new Russian, Polish and Swedish empires. There are also two different camera views in this game. There's a world overview where you can see villages, castles, caravans and war parties moving. When you go into a battle, village, or castle you switch to a third-person mode. The graphics engine is a little dated but it's easy to look past that. The battle scenes look pretty good; the game considers the time of day, location, and weather conditions, so the battles have some variety. There are many character types and classes but similar class types look identical. The background music is pleasant and adds the appropriate mood. Some of the music is carried over from the original game but there are some new tracks added for variety as well. The battle noises are very realistic and are well done. I like the way the party cheers after a victory but when you talk to people in the game, it's all text. I guess I'm spoiled by Oblivion. From an appropriateness standpoint this game is pretty good, but there are some things worth noting. There is violence, however blood can be disabled. There are some language issues such as da*n and being called an illegitimate son by some enemies. Religion plays a role now and you will see intolerance to various beliefs, including references to Islam and Catholicism. When you enter a town or a castle you are given a brief rundown of the rumors and happenings there. One of the messages said that a priest was giving communion to female parishioners all night long. There is an active community supporting this game. There are lots of unique mods and enhancements available. Make sure you keep your game up to date; in order to play on the servers you have to have the same game version. The ability to export/import your character helps in the event of a patch rendering your game save unplayable. The try before you buy download is pretty nice. You can get the full version of the game for free, but there's a level cap unless you purchase it for $15. If you're used to the freedom of Warband you may want to pass this one up. The storyline is about 20-30 hours long and ends abruptly so you cannot play your game after the last quest is completed. If you have the original Mount and Blade and want to try the multiplayer for a reasonable price I would recommend getting this. I have seen sales as low as $20 for both Warband and Fire and Sword.